1. Cook some bolognese with cinnamon and cloves1, about 750 g of meat's worth. 2. Make a big batch of bechamel sauce, maybe 75 g of butter's worth2. Mix it with half to 1 whisked egg & a generous grating of nutmeg. 3. Season and grill a few layers worth of sliced eggplant. 4. 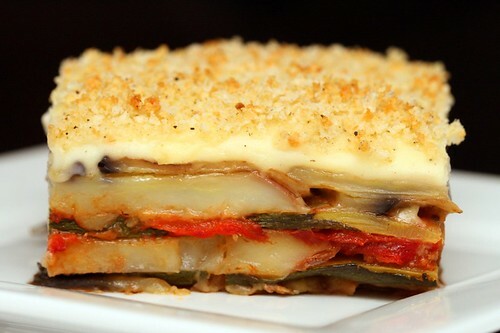 Layering from the bottom up: Thin layer of bolognese, the eggplant, a sprinkling of dried Greek oregano, a thicker layer of bolognese, and the béchamel custard. Finally sprinkle with grated hard cheese, such as Greek kefalotiri (reggiano works fine, too). 5. Bake in a 175ºC/350ºF oven for an hour or until golden on top. But is that enough? There has to come a point where a certain level of knowledge can be safely assumed, particularly with readers as talented as your fine selves. Are you flattered enough yet to forgive my laziness? (1) I recommend my summer bolognese, adding 5 ground cloves and 1 whole stick of cinnamon at the beginning with the onions. 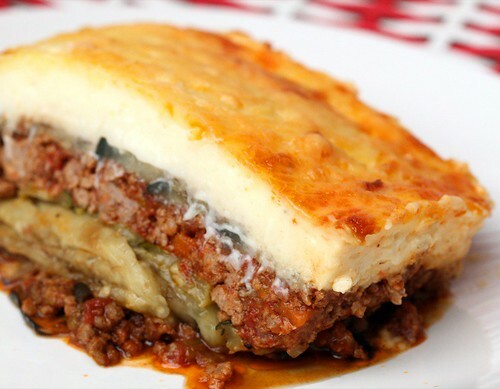 A mixture of half lamb mince and half beef mince works well for this. Finish with a grating of nutmeg. (2) We've made béchamel before, for macaroni cheese and tuna mornay. 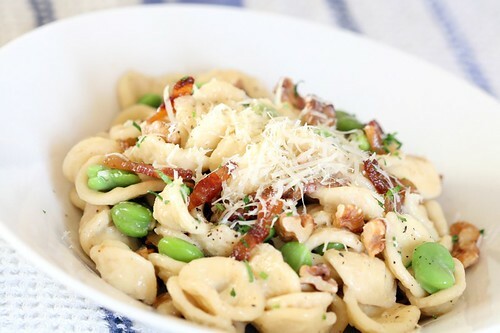 Make the sauce using butter, flour, milk, salt, and nutmeg, but unlike those recipes stop there and don't add cheese and such. Mario Batali, unsurprisingly, has also made it. I slept for close to 16 uninterrupted hours last night. A new personal best. Now that my night shifts have finished I'm looking forward to rejoining the real world. Work during gentlemanly hours, lunch during daylight, no physiological drops in core body temperature to herald the three-quarter point of my shift — it's going to be good. I've also been lucky that my return to normality seems to have coincided with a boost in the weather. It's springtime down here, and while we've oscillated between downpour and lovely, I have a feeling that things are about to hit their sunny stride. To commemorate spring I made green, broad-beany falafel. I don't know why it took my so long to make falafel a second time. The first time it worked out perfectly — crisp on the outside, warm and soft on the inside. Hearty enough to make a meal on its own, and of course perfect as an economical vegetarian filling for pita bread. They were tasty this time as well, but I think the recipe could do with some small adjustments. Apparently making falfel with cooked beans is a recipe for disaster (too much moisture for deep frying), but perhaps incorporating some cooked chickpeas into the soaked bean mixture would boost up the creamy/nutty factor and soften the slightly raw edge these falafel had. I'll keep you informed. I served these simply, with cucumber, tomato, and some sauces. For kick there was everyone's favourite sriracha, and for relief a tahini yoghurt sauce made from mixing tahini, greek yoghurt, lemon juice, salt, ground cumin, and a little olive oil. The exact amounts escape me but go ahead and experiment — it's really more of an art than a science. Recipe inspired by and almost an exact replica of this felafel recipe from Buffalo Buffet (now One Big Kitchen). 1. Remove the skins from the broad beans. If a couple are hard to remove and the bean is too tough to pierce with a sharp knife, throw it away. 2. Place all the ingredients except for the oil into a food processor and process until finely ground. The result should have the consistency of finely minced garlic and stay together when pressed into a ball. Don't stress out of there are a few slightly larger chunks on bean in there. 3. Heat 1-2 inches of oil in a heavy pot to medium-high heat. You'll need to experiment with what heat works for you, but it should take about a minute each side for the falafel to brown. Shape the felafel1, and cook in batches in the hot oil. Cook for a minute on each side, then remove to drain on kitchen paper and keep warm to serve. (1) It's up to you how you shape these. In the middle eat there is actually a little mechanical device designed to shape felafel, or you could use the devices at the ends of your arms to form them into rounded patties about an inch thick. I used a two-spoons quenelle technique because it's mess-free and easy once you're used to it. 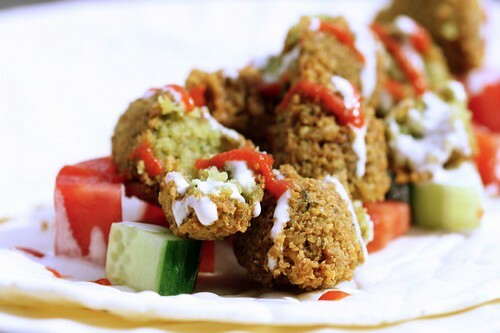 Either way, just make sure your falafel are firmly formed together so they don't fall apart in the hot oil. "You’re rushing around, you’re trying to think about healthy eating for your kids and you have a choice between a doughnut and a cereal," Dr. Kennedy said, evoking a hypothetical parent in the supermarket. "So Froot Loops is a better choice." Seriously? Is this what we're up against? Come on, if you're "trying to think about healthy eating" and you're deciding between a doughnut and Froot Loops, I have news for you: you're doing it wrong. The most worrying thing is that Kennedy's quote may actually reflect some insight into the minds of today's food consumer. I know that we're in deep trouble and that change is incremental, but can't we do better than an industry-run fee-for-promotion program that defends its inclusion of patently unhealthy choices by claiming their target audience is the set that would send their kids to school with a stick of butter and a pack of cigarettes? My retaliation is this vegetable bake. Of course with béchamel sauce there are healthier dishes out there, but if you ask me this is a smart choice. It's packed with nutrition, has no added sugar, only as much salt as you like, and by grilling the vegetables on a non-stick surface you can get away with very little oil. I made something similar a week earlier with feta crumble on top instead of béchamel, and if you ask me I think that one was actually better. It contains bolognese so it's not vegetarian, but here the bolognese plays only a supporting role and could just as easily be meat-free. Now maybe I'm just being lazy, but this is one of those use-whatever's-at-hand dishes that doesn't lend itself to a strict recipe. Simply put, take a bunch of vegetables (e.g. 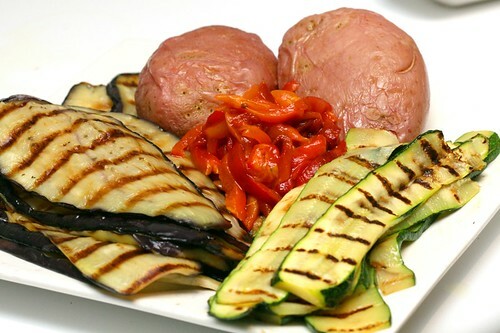 zucchini, eggplant, capsicum, potato), slice into pieces and grill. Layer with a simple bolognese seasoned with cinnamon and cloves, then top with béchamel sauce and bread crumbs. Bake until golden. It's that simple.